Purpose: To determine if timing of a supplement would have an effect on muscle damage, function and soreness. Methods: Twenty-seven untrained men (21 ± 3 yrs) were given a supplement before or after exercise. Subjects were randomly assigned to a pre exercise (n = 9), received carbohydrate/protein drink before exercise and placebo after, a post exercise (n = 9), received placebo before exercise and carbohydrate/protein drink after, or a control group (n = 9), received placebo before and after exercise. Subjects performed 50 eccentric quadriceps contractions on an isokinetic dynamometer. Tests for creatine kinase (CK), maximal voluntary contraction (MVC) and muscle soreness were recorded before exercise and at six, 24, 48, 72, and 96 h post exercise. Repeated measures ANOVA were used to analyze data. Results: There were no group by time interactions however, CK significantly increased for all groups when compared to pre exercise (101 ± 43 U/L) reaching a peak at 48 h (661 ± 1178 U/L). MVC was significantly reduced at 24 h by 31.4 ± 14.0%. Muscle soreness was also significantly increased from pre exercise peaking at 48 h. Conclusion: Eccentric exercise caused significant muscle damage, loss of strength, and soreness; however timing of ingestion of carbohydrate/protein supplement had no effect. White, James P., Beau Greer et al. 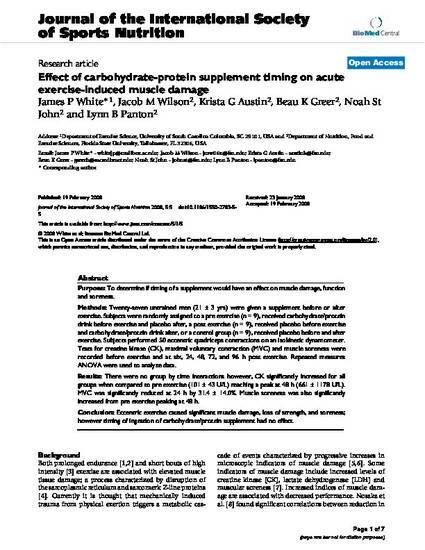 "Effect of Carbohydrate-Protein Supplement Timing on Acute Exercise-Induced Muscle Damage. "Journal of the International Society of Sports Nutrition 5:5 (2008).